All the ships and motorboats from Ukraine's border service have been put on alert since the clash in the Kerch Strait and the introduction of martial law by Kiev, Ukrainian State Border Service Chief Petro Tsigikal told the channel UATV Tuesday. "All the ships and motorboats from the State Border Service are on full alert. Almost all naval personnel are at sea today", Tsigikal stated. Martial law entered into force in the country on the 29th of November following the Kerch Strait crisis and affects all regions that border Russia as well as the coasts of the Black Sea and the Sea of Azov. READ MORE: Kerch Crisis: Who's Pulling Poroshenko's Strings? Commenting on Kiev's move, Russian President Vladimir Putin called it a provocation, adding that Ukrainian President Petro Poroshenko desperately needed martial law to compete against the opposition given his low popularity ratings ahead of elections. 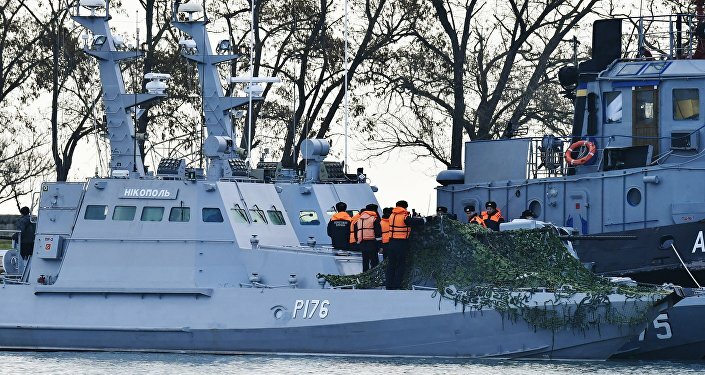 The law was announced after Ukrainian gunboats Berdyansk and Nikopol and the Yany Kapu tugboat illegally crossed the Russian maritime border and sailed toward the Kerch Strait, the entrance to the Sea of Azov. The vessels were seized by Russia after failing to respond to a demand to stop, and, after a brief clash, over 20 Ukrainian sailors were detained by Russian Border Guards.